While perusing a local shop aimed at healthy people – hikers, trekkers, climbers etc – we came across a cute book all about our local mountain range – mainland Spain’s highest, second only to the Alps in western Europe: the Sierra Nevada. We never cease to marvel at its beauty as we drive to Granada, or gaze out of the window from home towards the (currently) white peaks and distant wisps of snow – like an old man’s hair blowing in a gale – whipped up by the strong, high winds. 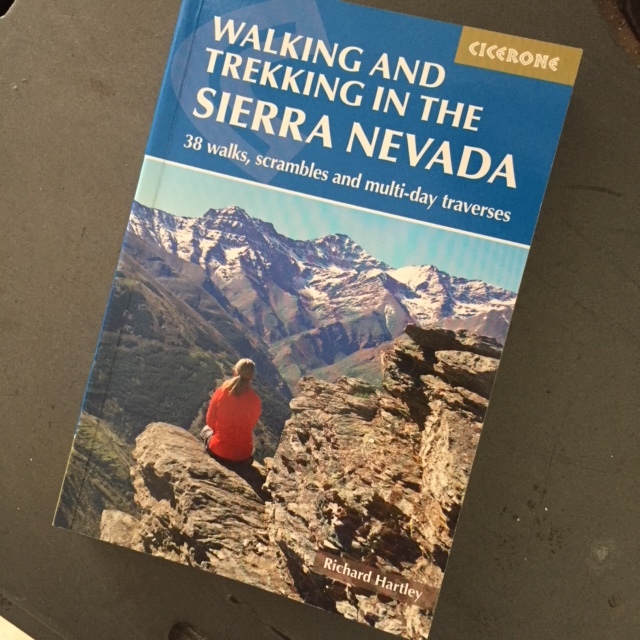 The book is titled ‘Walking and trekking in the Sierra Nevada – 38 walks, scrambles and multi-day traverses.’ Published by Cicerone at the end of 2017, it’s a beautifully designed guide with a good balance of text, photos and maps. Being just 17cm x 12cm, it’s easy to carry around, too. Considering our experience of spending no more than an hour or two higher up – think just 1200 metres (normally to eat tapas) – it’s a fabulous resource, and might just get us exploring more from, say, Capileira. It’s written by Richard Hartley who lives in Lanjarón with his wife Kiersten (see her nature photo site here). They run the popular Spanish Highs which takes people out on guided treks, runs mountaineering courses and so on. Richard’s experience of this area shines through – with information on easy walks to much harder challenges lasting a few days. It has a handy route summary table so you can pick routes that suit both your fitness level and the area you want to explore. The routes are split into chapters: Trevélez, Refugio Poqueira, Cumbres Verdes and so on – and are marked on maps and sometimes superimposed over photos, making it clear what you’re up against when making a decision about what route to tackle. There’s also a handy ‘how high is this mountain’ table with a reference to which routes it features in – for example, the famous Mulhacén (3483 metres; routes 2,5,6,27,31 and 32, if you must know). With nature notes, safety advice, camp/refuge locations, water sources and climate information, it must be a wonderful addition to a hiker’s library. We learnt that the range is Spain’s largest national park (status award in 1999) and that, for example, it’s home to over 60 species of birds. A great read for both the novice and more experienced trekker/climber. Onwards and upwards!